In 1856 J. B. Bell platted a township between Fortieth and Forty-Third Avenues East from Lake Superior to today’s McCullough Street and named the town Belville after himself. The following year the Panic of 1857 brought a halt to all growth in the area, and no one ever built a permanent home in Bellville. In 1871 Hugh McCulloch, a business associate of Philadelphia financier Jay Cooke and the U.S. treasury secretary from 1865 to 1869, purchased a large parcel of land between today’s Fortieth and Fifty-fourth Avenues East from the lakeshore to today’s Colorado Avenue (originally Summit Street) from lumberman John D. Howard. (Prior to Howard, the property belonged to Francis Dermay, a Michigan militiaman who received the land as bounty for his service in the War of 1812.) McCulloch was then living in England, where he and Cooke established the banking firm of Jay Cooke, McCulloch & Co. From his London office, he platted his Minnesota township and, obviously inspired by his newly adopted town, named its streets and public squares for English noblemen and landmarks as well as prominent members of Cooke’s banks, including himself. He called his township New London. New London’s first residents were General George B. and Mary Sargent, who built a home at Fortieth Avenue East and London Avenue (today’s London Road). Sargent, Cooke’s agent in Duluth, purchased all of New London from McCulloch following the Financial Panic of 1873 (caused by the failure of Cooke’s bank) which paralyzed development for the next ten years. George Sargent died in 1875 while on business in Germany. Following George Sargent’s death, New London became the property of his widow, Mary. In 1886 the Sargent’s son William and other investors formed the Lakeside Land Company, which purchased New London from Mary Sargent and began buying property between Fifty-fourth and Seventy-fifth Avenues East. Because the Lester River ran through the center of this new development, they named it Lester Park. The company built streets and sewers, added water and electricity to the area, and in 1892 built a streetcar line that ran from Twenty-second Avenue East all the way to the Lester River. Prior to that, visitors and residents alike could utilize the Duluth & Iron Range Railroad for transportation. The common council of the city of Duluth is hereby prohibited from ever granting any license to sell or dispose of any wines, spirituous or malt liquors within the limits of the territory hereby constituted as the city of Lakeside, after the same shall have been annexed to the said city of Duluth in accordance with the provisions of this act. Efforts to overturn the law began in the early 1970s and lasted until 2015. In 2016 Lakeside and Lester Park opened to liquor sales. Read about the efforts to repeal the law between 1973 and 2016 here. 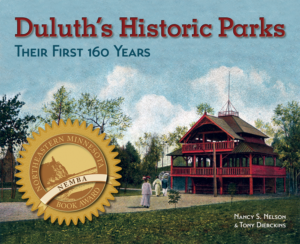 From Duluth's Historic Parks: Their First 160 Years by Nancy S. Nelson & Tony Dierckins (Zenith City Press, 2017) featuring over 300 historic photos, illustrations, and lithographs. Click on the cover to preview the book.